Disney's irresistible talking puppies in their first Christmas adventure. The Buddies are coming to town this Christmas in SANTA BUDDIES: THE LEGEND OF SANTA PAWS, a heartwarming holiday adventure on Disney Blu-ray&trade; Hi-Def Combo Pack and DVD, 25 November 2009, perfectly timed for gift giving. The pups take a fantastic journey to the North Pole in an exciting adventure featuring more new friends, fun, and teamwork than ever before. 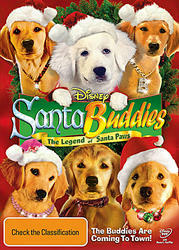 In SANTA BUDDIES: THE LEGEND OF SANTA PAWS, the lovable 'Buddies', B-Dawg, Budderball, Buddha, Mudbud and Rosebud, embark on a thrilling journey to the magical world of Santa's Workshop. When Puppy Paws, the fun-loving son of Santa Paws, gets tired of the North Pole, he finds Budderball's name at the top of Santa's 'naughty' list. The inquisitive Puppy Paws heads south to meet the Buddies and see how 'ordinary' pups spend their days. However, when the world begins to forget the true meaning of Christmas and the magic of the season literally begins to melt away, it's up to Puppy Paws and his newfound Buddies to save the day in another epic adventure, highlighting the importance of collaboration, courage and tradition in a celebration of life and friendship. SANTA BUDDIES: THE LEGEND OF SANTA PAWS stars Christopher Lloyd (Back to the Future), George Wendt (Cheers) and the voice talent of Tom Bosley (Happy Days). Featuring new friends and more teamwork than ever before, the Buddies even travel to Australia to deliver Christmas cheer. Perfectly timed for Christmas, SANTA BUDDIES: THE LEGEND OF SANTA PAWS includes a rockin' sing-a-long bonus feature and is sure to be at the top of everyone's Christmas list. From their amazing dog sled adventures in SNOW BUDDIES, to going where no dog has ever gone before in SPACE BUDDIES, now you can add SANTA BUDDIES: THE LEGEND OF SANTA PAWS to your 'Buddies' collection! Unleash a stocking full of holiday cheer this Christmas with this fun-filled Blu-rayTM and DVD release. It's Buddy-loving fun the whole family will enjoy again and again, delivering enough holiday cheer to last a whole year!